Went off to College at Clinch Valley. Received a B.A. in Middle Grade Education in 1991. Moved to Burkesville, Kentucky and started coaching. Met my wife in 1998 and got married in 1999. I have one stepchild that teaches in Bowling Green and one son that is in the second grade. My greatest memory is the time we beat Whitesburg in the first round of the District tournament. Jerry Hall has a birthday today. 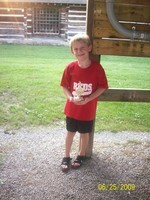 Elijah at the Rookie league picnic for the Reds receiving his trophy. My step-daughter Michelle during the 4th of July. 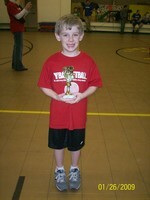 Elijah receiving his basketball trophy. Mom and Dad at Elijah's Birthday party. Me and my wife, Tammy, at Myrtle Beach.